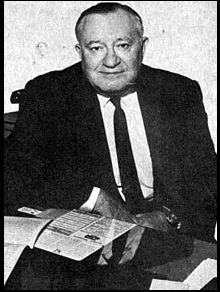 On December 30, 1998, legendary promoter and longtime National Wrestling Alliance President Sam Muchnick passed away in his home in St. Louis. He was 93. Born Jeshua Muchnick in the Ukraine, his family moved to St. Louis when he was just six-years-old. After growing up and attending school there, Muchnick worked for the US Postal Service and later, became a writer for the St. Louis Times in 1926. He covered the Cardinals and professional wrestling. After working for a time with promoter Tom Packs, Muchnick teamed with Pinky George and Tony Stetcher, and formulated the plan of a collaboration of all regional promotions. The three promoters (with two others) and Orville Brown would then form the National Wrestling Alliance in Waterloo, Iowa, with Brown as its first champion. Muchnick’s first wrestling card was in December 1945 at the Kiel Auditorium that drew over 3,700 fans. Five years later, he was elected NWA President by his fellow promoters; he would hold that office for 22 of the next 25 years. Along with forming The St. Louis Wrestling Club, Muchnick produced Wrestling at the Chase for KPLR-TV (which garnered huge local ratings from 1959-1983), and signed agreements with territories in Mexico, Japan, Europe, and the Caribbean. During his tenure, St. Louis became a proving ground for many future legends, and hosted more NWA World title changes than any other city. Muchnick retired on January 1, 1982, and was given a proper sendoff by the St. Louis fans. As a beloved sports figure in the community and the industry, he had often been dubbed, “The Pete Rozelle of Wrestling”, in reference to the venerable NFL Commissioner at the time. After his retirement, the NWA’s power base fell apart, and within two years, Vince McMahon left the group and began his world wide expansion. Muchnick’s departure from the sport had signaled a changing of the guard… and of eras.